I love the way Oswald Chambers says this because I’ve actually thought it–I don’t think it anymore. When we first read the statements of Jesus, they seem wonderfully simple and unstartling. . . For instance, the Beatitudes initially seem to be merely soothing and beautiful precepts for overly spiritual and seemingly useless people, but of very little practical use . 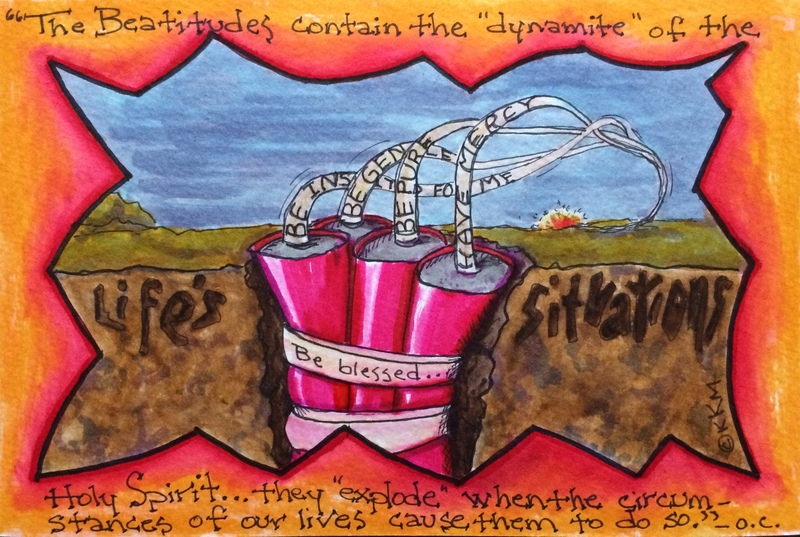 . .
Blessedness begins with a bang–and it’s us who takes on the majority of the mess. However, if we take them, the “blessed’s,” seriously, they WILL hurt, they WILL explode–why? Because they ask from us unnatural things and in order to obey them we have to look outside of ourselves. It is only through the power of the Holy Spirit and the love of Christ in us that causes us to be merciful or kind or loving or meek or, or, or . . . in the face of life situations where our human nature is kicking and screaming to have its way and begs for justice–“But I deserve better!”. After all, don’t we have rights? Shouldn’t we be treated fairly? The reality is, did Jesus have rights? Was he treated fairly? Did he tolerate abuse and rebuke and ridicule for us? And to think He had a choice in the matter and yet he still came down and did it for us. So, it’s our turn to return the love (unconditionally) in every life situation.